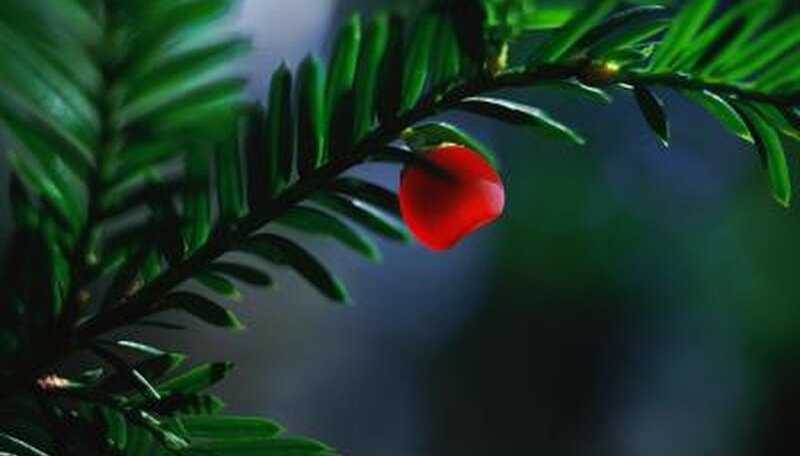 Yew bushes are widely planted landscaping bushes that grow slowly, stay green year-round and require little maintenance. There are three types of yew: the upright, the rounded and the spreading forms. The spreading form is especially prone to overgrowing an area as the low branches often root and start new plants. All of the yew bushes transplant well while they are young, but the older the plant gets, the longer the taproot and the greater the chance of death or deterioration. Plan the transplant for the fall when the temperatures are cooler and plant growth slows. Water the yew bushes a couple of days before the day of transplantation. This will help the plant survive the shock of its roots being disturbed and will hold the soil together better. Soak each bush with 3 to 5 gallons of water, unless the soil is already damp. Dig out the new hole in an area where the pH level is 6 to 6.5 and the soil drains well. Allow at least 3 feet of depth and width to make room for the transplanted yew. Wrap the bush with twine to hold the branches out of the way during the transplant, pulling the lower branches up to the center of the plant. Dig around the perimeter of each bush, staying out at least 18 inches from the main stem. Remove the dirt from the outer edge to make room for digging deeper under the yew bush. Use a sawzall or loppers to cut roots as you expose them that lie outside the perimeter of the root ball. Dig out carefully around the roots, creating a rootball 3 feet wide by 3 feet deep. Lift the yew plant from the hole, using either a tractor or several people with strong backs since the weight will range anywhere from 400 to 850 pounds. Set it on a tarp and drag it to the new planting site or use the tractor to transport the bush. Set the rootball into the prepared hole and straighten the yew. Add soil to the hole, tamping it down with a pole tamper every few inches. Continue adding soil until you have filled the hole evenly with the ground surface. Water the newly transplanted yew immediately after planting, and then as needed for the next six weeks to keep the soil damp until new growth resumes. Yews generally do not need extra watering once they are established.